Benjamin West's painting of the delegations at the Treaty of Paris: John Jay, John Adams, Benjamin Franklin, Henry Laurens, and William Temple Franklin. The British delegation refused to pose, and the painting was never completed. The Treaty of Paris, signed on September 3, 1783, ended the American Revolutionary War between Great Britain on one side and the United States of America and its allies on the other. The other combatant nations, France, Spain and the Dutch Republic had separate agreements; for details of these, and the negotiations which produced all four treaties, see Peace of Paris (1783). Its territorial provisions were "exceedingly generous" to the United States in terms of enlarged boundaries. Signing of the preliminary Treaty of Paris, November 30, 1782. The treaty document was signed in Paris at the Hotel d'York (presently 56 Rue Jacob), by John Adams, Benjamin Franklin, and John Jay (representing the United States), and David Hartley (a member of the British Parliament representing the British monarch, King George III). Benjamin Franklin was a strong proponent of Britain ceding the Province of Quebec (today's eastern Canada) to the United States because he believed that having British territory physically bordering American territory would cause conflict in the future. Britain, however, refused. On September 3, 1783, Great Britain also signed separate agreements with France and Spain, and (provisionally) with the Netherlands. In the treaty with Spain, the territories of East and West Florida were ceded to Spain (without a clear northern boundary, resulting in a territorial dispute resolved by the Treaty of Madrid in 1795), as was the island of Minorca, while the Bahama Islands, Grenada, and Montserrat, captured by the French and Spanish, were returned to Britain. The treaty with France was mostly about exchanges of captured territory (France's only net gains were the island of Tobago, and Senegal in Africa), but also reinforced earlier treaties, guaranteeing fishing rights off Newfoundland. Dutch possessions in the East Indies, captured in 1781, were returned by Britain to the Netherlands in exchange for trading privileges in the Dutch East Indies, by a treaty which was not finalized until 1784. Signature page of the Treaty of Paris courtesy of the National Archives and Records Administration. Preface. Declares the treaty to be "in the name of the most holy and undivided Trinity", states the bona fides of the signatories, and declares the intention of both parties to "forget all past misunderstandings and differences" and "secure to both perpetual peace and harmony". Ratification of the treaty was to occur within six months from the signing by the contracting parties. Historians have often commented that the treaty was very generous to the United States in terms of greatly enlarged boundaries, which came at the expense of the Indian allies of the British. The point was the United States would be a major trading partner. As the French foreign minister Vergennes later put it, "The English buy peace rather than make it". Privileges that the Americans had received from Britain automatically when they had colonial status (including protection from pirates in the Mediterranean Sea; see: the First Barbary War and the Second Barbary War) were withdrawn. Individual States ignored Federal recommendations, under Article 5, to restore confiscated Loyalist property, and also evaded Article 6 (e.g., by confiscating Loyalist property for "unpaid debts"). Some, notably Virginia, also defied Article 4 and maintained laws against payment of debts to British creditors. Individual British soldiers ignored the provision of Article 7 about removal of slaves. The real geography of North America turned out not to match the details used in the Treaty. The Treaty specified a southern boundary for the United States, but the separate Anglo-Spanish agreement did not specify a northern boundary for Florida, and the Spanish government assumed that the boundary was the same as in the 1763 agreement by which they had first given their territory in Florida to Britain. While that West Florida Controversy continued, Spain used its new control of Florida to block American access to the Mississippi, in defiance of Article 8. In the Great Lakes area, the British adopted a very generous interpretation of the stipulation that they should relinquish control "with all convenient speed", because they needed time to negotiate with the Native Americans, who had kept the area out of United States control, but had been completely ignored in the Treaty. 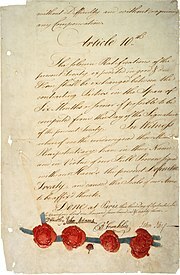 Even after that was accomplished, Britain retained control as a bargaining counter in hopes of obtaining some recompense for the confiscated Loyalist property. This matter was finally settled by the Jay Treaty in 1794, and America's ability to bargain on all these points was greatly strengthened by the creation of the new constitution in 1787. Only Article 1 remains in force as of 2013. ↑ Sandy Whiteley, Sandy (2002). On this date... a day-by-day listing of holidays, birthdays, and historic events and special days, weeks, and months. McGraw-Hill Professional. p. 366. ISBN 978-0-07-139827-5. http://books.google.com/books/about/On_this_date.html?id=sKCfomKSa74C. ↑ Jones, Howard (2002). Crucible of Power: A History of American Foreign Relations to 1913. Rowman & Littlefield. p. 23. ISBN 978-0-8420-2916-2. http://books.google.com/books?id=TFyLOUrdGFwC&pg=PA23&lpg=PA23&ots=R4SlGML4VE&sig=Jf3UF5-rG4gZ_fj56vnrQwQOi2g#v=onepage&q&f=false. ↑ Benn, Carl (1993). Historic Fort York, 1793–1993. Dundurn Press Ltd. p. 17. ISBN 978-0-920474-79-2. http://books.google.com/books?id=Zu0hgVoIj3UC&pg=PA17&lpg=PA17&ots=LCcVf9I7f7&sig=zeKc7-_kZudvZs2aZhIoFABED0w#v=onepage&q&f=false. ↑ United States Department of State (2013). "Treaties in Force". p. 307. http://www.state.gov/documents/organization/218912.pdf. Retrieved 2014-03-08. Hoffman, Ronald; Peter J. Albert editor (1981). Diplomacy and Revolution: The Franco-American Alliance of 1778. University of Virginia Press. ISBN 0-8139-0864-7. http://www.amazon.com/Diplomacy-Revolution-Franco-American-Alliance-1778/dp/0813908647. Hoffman, Ronald; Peter J. Albert editor (1986). Peace and the Peacemakers: The Treaty of 1783. University of Virginia Press. ISBN 0-8139-1071-4. http://www.amazon.com/Peace-Peacemakers-Perspectives-American-Revolution/dp/0813910714. Perkins, James Breck (1911). "Negotiations for Peace". France in the American Revolution. Houghton Mifflin. http://books.google.com/books?id=OFIsAAAAMAAJ&printsec=titlepage. Stockley, Andrew (2001). Britain and France at the Birth of America: The European Powers and the Peace Negotiations of 1782–1783. University of Exeter Press. http://www.historycooperative.org/cgi-bin/justtop.cgi?act=justtop&url=http://www.historycooperative.org/journals/wm/60.1/br_11.html. Franklin, Benjamin (1906). The Writings of Benjamin Franklin. The Macmillan company. http://books.google.com/books?id=NWxukp7eEcMC&pg=PA108&lpg=PA108&dq=Joseph+Matthias+G%C3%A9rard+de+Rayneval#PPA108,M1.